This step-by-step guide, written by a best-selling author and former Wall Street titan, provides all the information—and inspiration—you need to feel better, reduce aches and pains, and push back against aging with a personalized fitness program that's right for you. Whatever your fitness goals or preferences, this book is designed to help you pursue the health program that works for you. An inspirational speaker, author, and former Wall Street rainmaker, Jim Owen was 70 when he decided he had to get fit. Years of a chair-bound lifestyle were taking their toll. Realizing that the old bodybuilding approach was no way to tackle the stiffness, weakness, and aches and pains that come with age, he set off on a journey of discovery and transformation. With help from the experts, he developed a common-sense, step-by-step program that can be tailored to any level of physical ability. Along the way he learned why cardio machines aren't enough, what it takes to be "functionally fit" for daily life, and how to stay motivated. Today, Owen is in better shape than he was at 25, and he is a passionate evangelist for fitness as a way of life. 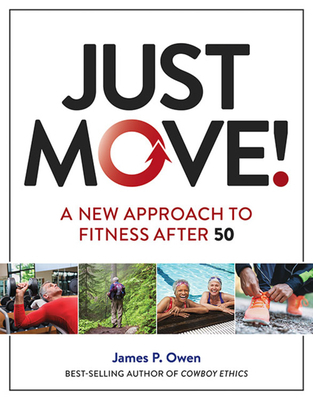 He has proved that you don't have to be powerless in the face of advancing years: if you make a commitment to "just move," you can take charge of the aging process and make your coming years the best they can be. The book is divided into two sections, with the first providing fascinating information and the second showing step-by-step details of how to put the best fitness principles into practice. JAMES P. OWEN is a forty-year veteran of Wall Street and is also the Founder and CIO of the Center for Cowboy Ethics and Leadership. He is the best-selling author of The Try: The Secret to Success in Life and Career, Cowboy Values: Recapturing What America Once Stood For, and The Prudent Investor. He resides in Austin, Texas.